Breastfeeding is the best gift you could give to your baby and is very rewarding but also requires effort and dedication. That is why it is highly recommended to attend a good Breastfeeding Course during pregnancy so you will be ready from his first feed. 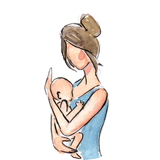 If your baby is already born we recommend you the Breastfeeding Support Sessions. Physiology of lactation and why is important for your child's health. How to ensure that your baby is feeding well. Common complications and how to avoid them. Proper storage of the milk.